Apologies for the poor photo quality. 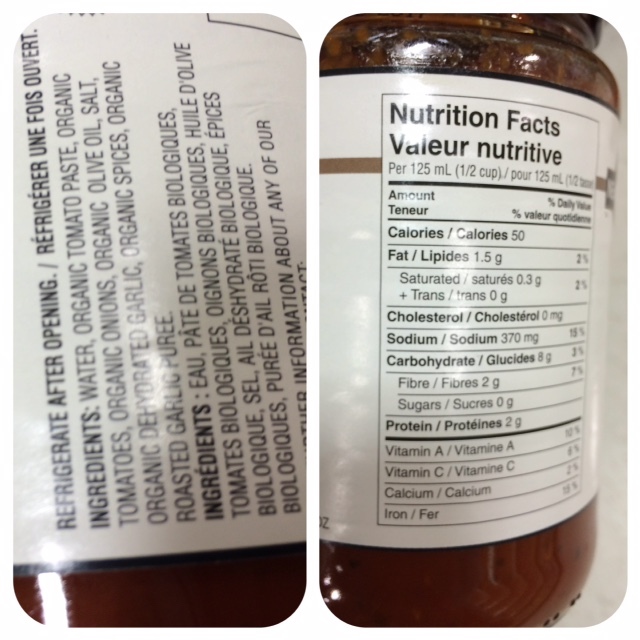 Hopefully you’re able to see that the nutrition facts panel indicates that there’s no sugar in this pasta sauce. That’s grand and all, no one wants a sugary tomato sauce. It’s also puzzling because tomatoes (and many other vegetables) naturally contain sugar. So how does one end up with zero grams of sugar in a 1/2 cup serving? This second sauce, despite having no added sugar, still contains 6 grams of sugar per serving. This is much more the norm than the sauce in the first photo. I know that people are trying to cut back on sugar. That’s great. But this is another example of why you might want to pay more attention to the ingredients in a food than to the nutrition facts panel. These are very similar products but tell rather different stories when it comes to sugar content. One supposedly contains no sugar, while the other contains about one and a half teaspoons in a serving. Even if you’re trying to cut back on sugar there’s really no point in getting riled up about a little bit of sugar naturally occurring from vegetables. 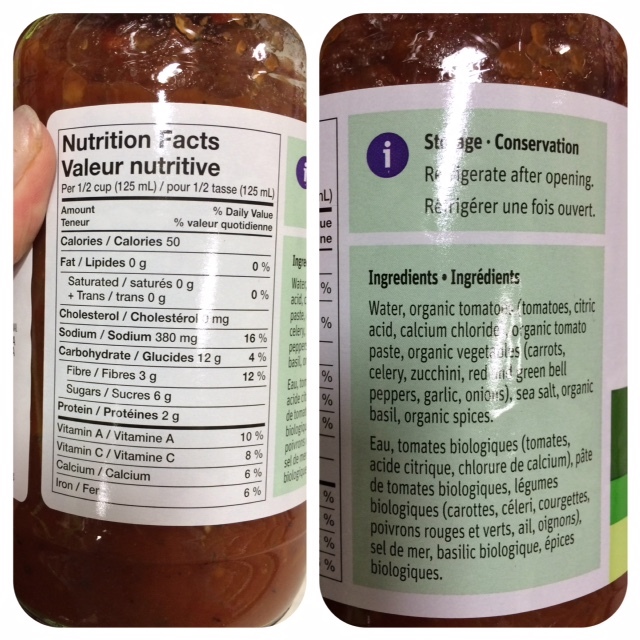 Tags: added sugar, grocery store lessons, healthy eating, ingredients, nutrition, nutrition facts, nutrition labels, pasta sauce, sugar, tomato sauce | Permalink. It was all over the news last week: the World Health Organization has released draft guidelines on sugar intake. These guidelines recommend a further reduction in added sugar intake from less than 10% of total daily calories to less than 5% of total daily calories. 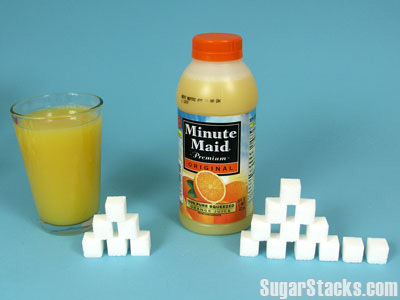 They state that this would be roughly 6 teaspoons of sugar a day for the average person. But what does this really look like? Let’s look at the “average” person first. The “average” sedentary Canadian woman (31-50 years of age) needs roughly 1, 800 calories per day (1). Honestly, that sounds like rather a lot to me. I’m shorter than the average Canadian woman but far more active; my job is very physical and I’m currently training for the Boston Marathon and that’s about all I need in a day. Anyway… Let’s pretend that Health Canada isn’t over estimating our caloric needs. That would mean that the average Canadian woman should aim to have no more than 90 calories a day from added sugars. Knowing that one gram of sugar contains about 4 calories that means that this Average Woman would be permitted 22.5 grams of added sugar a day, or 5.63 teaspoons. The Average Man (same age range) needs about 2, 350 calories a day. That would mean that he could have 117.5 of those calories from added sugar, or 29.38 grams, or 7.34 teaspoons. Now, just to be clear, even though your body doesn’t distinguish between added sugar, refined sugar, unrefined sugar, naturally occurring sugar, yada yada, the WHO is only referring to added sugars. Lest you think that the food industry can get tricky and use pureed fruit or fruit juice concentrate to sweeten foods and get around these counting as “added sugars” these have been included in the definition of added sugar. Just as most of the sodium in our diets is hidden in processed and packaged foods, so is much of the sugar. It’s not going to be as simple as eliminating the teaspoon of sugar in your cup of tea. Although, if you’re one of those people who adds two sugars to your coffee, once you’ve had two cups you’re creeping up on that limit. A small (16oz) Coke contains 41.4 g of sugar or 10.35 teaspoons (2). A medium DQ Blizzard contains 74 g of sugar or 18.5 teaspoons (3). A vanilla latte at Starbucks has 35 g of sugar or 8.75 teaspoons (4). A 3/4 cup serving of Liberte 2% Coconut Greek Yoghourt contains 19 g of sugar or 4.75 teaspoons (reference: the tub in my fridge). Two slices of Dempster’s 12 Grain Bread contain 6 g of sugar or 1.5 teaspoons (5). Check out this infographic for more. To be fair, some of these sugars will be naturally occurring. But… How are we as consumers to know how much of the sugar is naturally occurring and how much is added? And does it really matter? Unless we are eating diets that consist solely of unprocessed foods it’s going to be damn near impossible for any of us to know precisely how much sugar in a food is added and how much is naturally occurring. Unless food labels start changing to indicated added and naturally occurring sugars it’s going to be a bit of a guessing game. Personally, I think it would be better if we focussed less on individual nutrients and focussed more on overall diet. 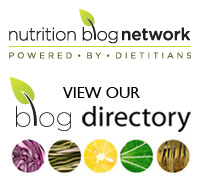 Recommending limits on processed and fast food and encouraging increasing consumption of home cooked meals and minimally processed foods would be easier to follow. The way these recommendations are framed they just steer people in developed countries toward foods sweetened with non-nutritive sweeteners and allow the food industry to market nutritionally-void foods as healthy choices by replacing sugar with other things. They also make things like fruit juice perfectly acceptable even though they are essentially just liquid candy. If you’re interested in contributing to the draft guidelines you can download the complete document here and send your comments in by March 31st. Tags: 5% of calories, added sugar, guidelines, sugar, sugar measurements, WHO, World Health Organization | Permalink.